All of us have been to the airport and with flying taking over as the most preferred form of travelling today, we end up going there very often. Increasing passenger growth with capacity constraints means operating an airport is quite a demanding affair. There's a lot that goes into the smooth functioning of an airport including special vehicles that form an integral part of airport operations. However, as a passenger, one doesn't get to see these vehicles up-close. 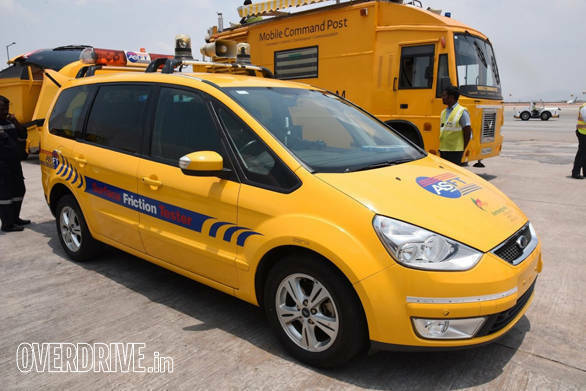 All that changed when the Kempegowda Airport in Bengaluru recently invited OVERDRIVE to get up-close with their entire fleet of airport operation vehicles. 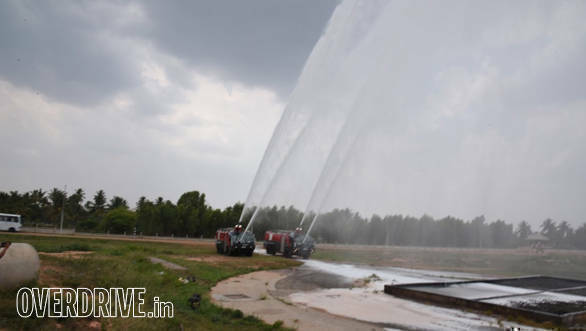 The folks from Bangalore International Airport Limited (BIAL) showcased these important vehicles to us and we also took part in a mock firefighting drill. The Kempegowda International Airport in Bengaluru is the third busiest airport in India today. Safety is key and very important and was one of the first to purchase an entire fleet of modern airport vehicles. Let's take a look at these airport machines! 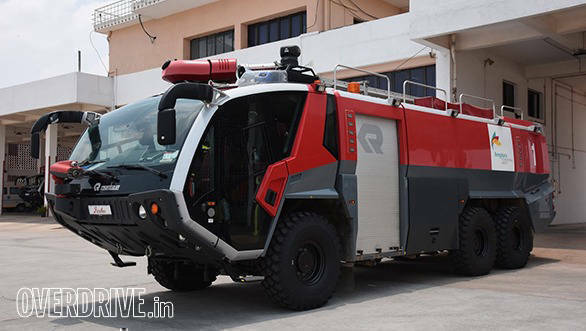 One of the most modern fire-fighting vehicles in the world today is the Rosenbauer Panther. These machines are made in Austria and can be seen in the largest airports today. BIAL was one of the first to procure the Panther and they didn't just get one but four such beasts. This vehicle is so important that if something goes wrong with it, an aircraft won't be let to land at the airport. With great responsibility, the Panther gets great power. It's powered by a 18,000cc diesel engine sourced from Caterpillar and produces a massive 700PS! The Panther may weigh close to 40 tonnes (thanks to the sheer size of the vehicle and 14,000 litres of water and foam) but it can still reach a top speed of 120kmph! All this makes it an ideal fire-fighting vehicle at an airport. We took part in a mock fire drill with the Panther and were mighty impressed to see it in action. Apart from the powerful engine and presence, this special truck boasts of special features. The main water pump, for instance, can put out 6,200 litres of water and foam a minute while extra turrets on the roof and bumper can spray 4,800 and 1,500 litres every minute. During the drill, we were amazed to see a fire pit get doused in a matter of seconds! An infrared camera helps the driver and firefighters look through dense smoke, fog or rain. To make things even better, the Panther can also be driven off-road, after all, it's a 6x6. We were driven in it and the transition from the smooth runway to off-road terrain was handled with ease. It literally glided on broken sections and rocky terrain and the ride was actually quite comfortable. 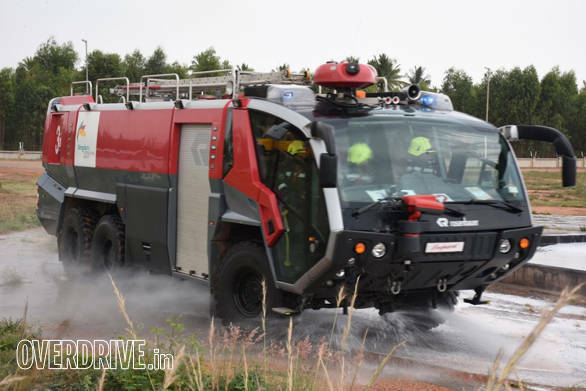 The Rosenbauer Panther is one of the best fire-trucks ever produced and BIAL says they have ordered the more powerful and larger Panther 8x8 which will be deployed when the new terminal is ready by the year 2020. As the name suggests the runway rubber remover is designed to keep the runway and aircraft areas free of rubber debris that's left behind by an aircraft while it lands and takes-off. The removal of rubber abrasion and marking is done with ease thanks to this special vehicle. 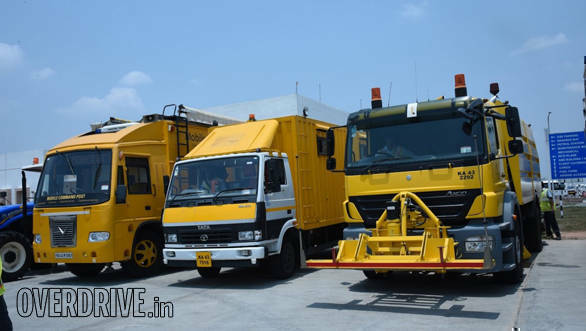 The Bangalore Airport uses a MAN truck that's been specially converted to handle this task. 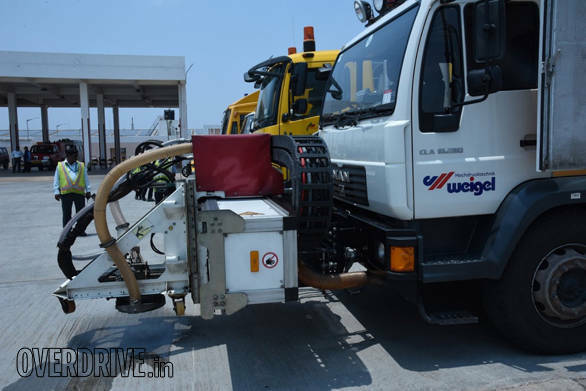 The truck holds water that is sprayed onto the surface by specially developed high-pressure water jets and uses very little water in the process. It is claimed to use only 10-percent of water when compared to other conventional systems. Friction levels are reduced considerably and this, in turn, makes it safer for the aircraft to land and take-off. 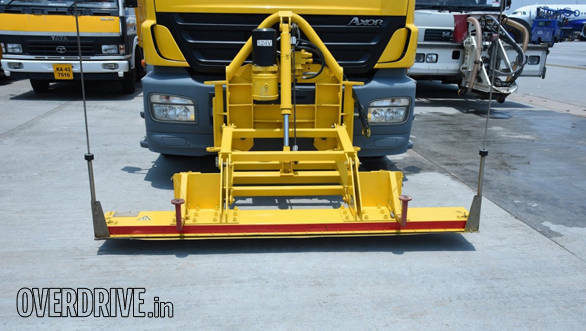 The runway sweeper is a Mercedes Truck that is modified to accommodate a vacuum machine powered by a 230PS auxiliary engine. This helps keep the runway free of debris and foreign objects. This is a very important vehicle as it helps keep the runway safe to operate. Apart from the vacuum machine, the front of the vehicle features a magnetic beam that runs across the width of the truck to help pick up metal objects that can otherwise damage an aircraft. We saw the vehicle in operation and the magnetic beam attracts metal objects with ease. The Mobile Command Post is unique to the Bangalore Airport. 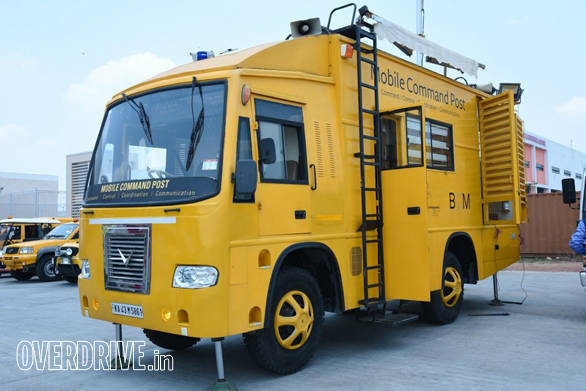 Developed in Bangalore, this vehicle literally makes the airport operations centre a mobile unit. This vehicle helps to get as close to the operations area and is usually the first to respond to an emergency. The MCP uses the start of the art equipment that helps in commanding, controlling, coordination and communication. We were taken inside the MCP and it did feel like we were in a modern communications office and not inside a conventional vehicle. Ever wondered what this Ford Galaxy MPV was doing at the Bangalore airport? We did too until the team from BIAL informed us that it actually is used to test the friction on the runway. As mentioned earlier, the runway needs to always maintain a friction value that is safe for aircraft to land and take-off. This vehicle features a measuring tool that is mounted to the loading bay of the vehicle and helps check friction levels. Based on these results, the authorities deploy the runway rubber remover etc. The Ford Galaxy is made in the U.K by a specialist and was chosen as the ideal vehicle as it offers enough room for the equipment and its operators.